A house painter by trade, Ferdinand Sylvaro was a Nantucket native of Portuguese decent and married a woman named Althea Macy (not to be confused with scrimshander Aletha Macy) Ferdinand Sylvaro worked from his shop that was attached to his home, on 97 Orange Street. He was among the “on land” weavers who made baskets in the 1920s. 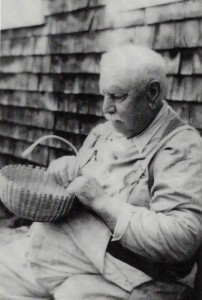 Research suggests that his neighbor, AD Williams, taught him the craft of weaving Nantucket lightship baskets. AD Williams was taught by William D. Appleton. Ferdinand Sylvaro owned molds that belonged to Davis Hall, a famous basket maker of the late 1800s who was a lightship keeper of the New South Shoal. The story of Ferdinand Sylvaro is a classic example of the lineage of the craft of making lightship baskets; being passed down from lightship keeper, to the next generation.